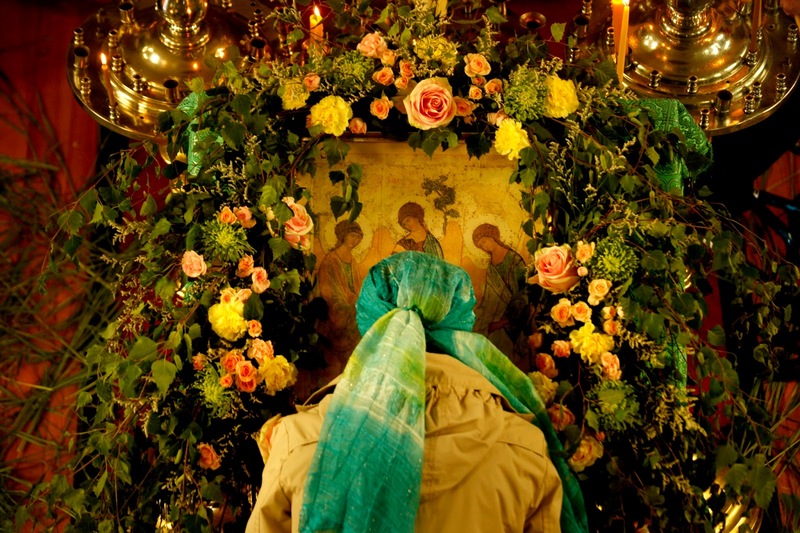 On this feast [of Pentecost] according to custom, temples and homes of the faithful relating to the characteristics of this feast are also decorated with trees, grass and flowers. This is how the Old Testament Church celebrated Pentecost, offering on this day a beginning of the harvest (Lev.23:10-22; Num. 28:26). In accordance with these customs of the Old Testament Church, probably, the room on Zion in which the Apostles received the Holy Spirit on this feast was also decorated. 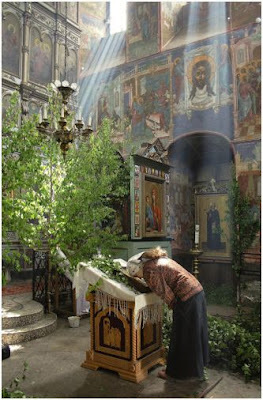 From here this custom was also spread throughout all the Church. The thought of the appearance of God as three strangers to Abraham at the Oaks of Mamre, where the tent of the patriarch stood, could also have influenced this custom. 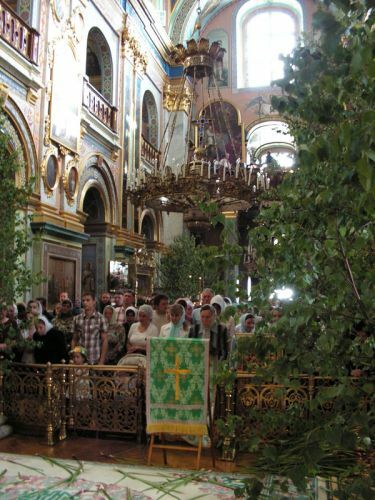 Celebrating the Holy Trinity, before Whom Abraham once bowed down in the Oaks of Mamre, ancient Christians on the day of the Holy Trinity spread tree branches and flowers in the temples to see that in this way the decorated temple of God more obviously represents the Oaks of Mamre and the tent of Abraham where once the Triune God had the good will to appear. 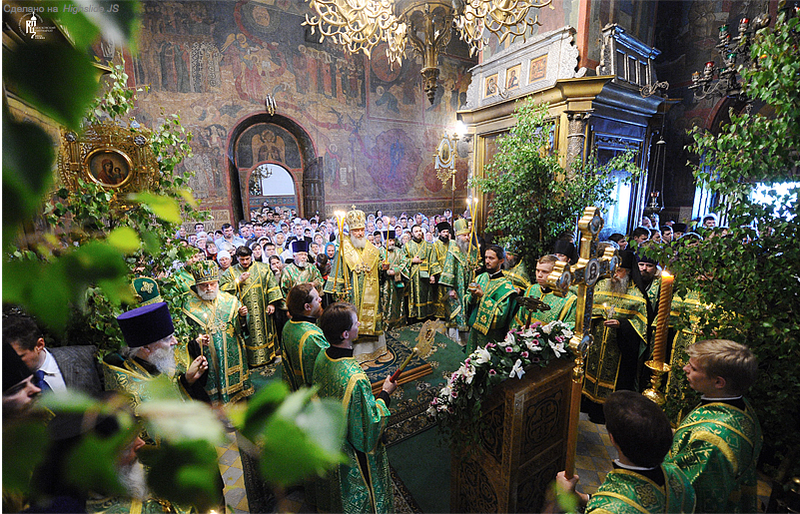 Now branches and flowers are offered to God as the beginning of the renewing Spring. But at the same time they serve together as a symbol of the Church of Christ, which with the appearance of the grace of the Holy Spirit flourished in it, according to the expression in the church hymns, like a white lily. 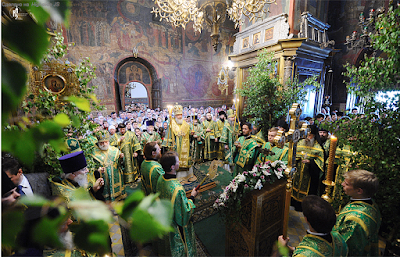 It also points out the renewal of the people by the power of the descent of the Holy Spirit, (serving as a symbol of His very grace which we ask for on this day and which, being recognized by true believing souls, smells sweet to them through a great variety of spiritual gifts and pious deeds), and for the future resurrection of our dead brethren for which we especially pray on this day.